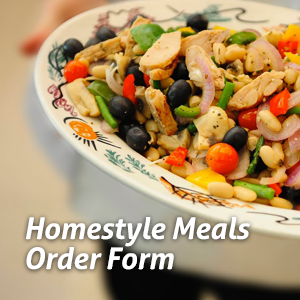 The Golden Circle Home Style Meals service offers a wide selection of affordable, nutritious and ready-to-eat meals. To order our home style meals, visit us at the Centre and ask for the home style meals order form or download the form by clicking on the picture to the right of this screen. PLEASE Submit your order by WEDNESDAY and your order will be ready for pickup by the following WEDNESDAY, or sooner, if the kitchen is not busy. PLEASE WAIT TO PICK UP YOUR MEALS until you receive a confirmation phone call from one of our staff or volunteers. FOR HOME DELIVERY, the meals will be delivered to your door (WITHIN THE CITY OF RED DEER ONLY), on the following TUESDAY in the morning. Please arrange to be home for the volunteer driver who delivers the meals. If for some reason you cannot be at home, please call the Golden Circle, and let us know, so that the driver can make alternate arrangements. THANK YOU!! The Home Style Meals menu provides for healthy and enjoyable eating. You can choose from our list of full course dinners; see drop down menu Rentals & Kitchen, frozen meal menu for complete list of meals. Order anytime when it’s convenient for you. Just remember your order must be in by Wednesday for next week pickup. Minimizes the need to grocery shop, cook and wash dishes. No mess or fuss. Specially packaged for microwave; easy to re-heat. Meals must be thawed first. Please see the frozen meals menu under the kitchen and rentals drop down on our website for a detailed list of the variety of meals available.